Planet 13, a vertically integrated cannabis business adjacent to the Las Vegas Strip, boasts that it has the world’s largest retail dispensary. The design of a marijuana dispensary can be memorable or, well, meh. Convenient, spacious shops with visual product displays and Instagrammable features can keep customers coming back and revenue flowing. But stark, fluorescent-lighted spaces with no amenities—such as on-site parking or an ATM—can send them to the dispensary down the road. Below, cannabis retail shop owners share their tips for designing top-notch dispensaries. Do open in a convenient location. 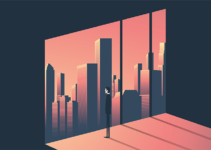 Sixty-seven percent of consumers say a convenient location is one of the most important factors when choosing where to purchase cannabis, according to consumer research shared by BDS Analytics, a Boulder, Colorado-based cannabis data analytics firm. Choose a dispensary location close to interstates, highways or heavily trafficked thoroughfares. Consider the nearest attractions or other popular businesses and select a site that has ample parking. Planet 13, for example, is just off Interstate 15 and within walking distance of popular hotels on the Las Vegas Strip. It’s as close to the world-famous gaming corridor as a dispensary can legally be, Groesbeck noted. Do create a spacious, inviting environment for customers. “Like with any retail space, you must be strategic in designing a retail floor that is built for accommodating a high volume of foot traffic that allows customers to navigate the space comfortably,” said Shaya Brodchandel, CEO of Harmony, a vertically integrated medical marijuana business in New Jersey with a retail store in Secaucus. 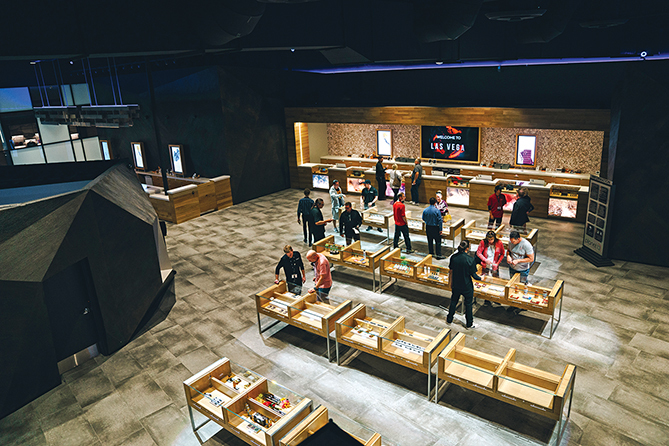 Create ample space at counters or on the retail floor for customers to navigate product displays and consult with budtenders, advised Stephen Matt, the chief medical officer at Caliva, a vertically integrated California marijuana business with a dispensary in San Jose. To that end, hire a professional retail designer to consult on counter height, aisle width, foot-traffic patterns, building materials and lighting, Matt added. Those elements will help you create a welcoming, warm retail experience, he noted. Do provide customers with in-store options for checkout or medical marijuana consultations. Provide an express lane or separate pickup counter for online orders and create a private space for medical marijuana patients to consult with budtenders. “Everything in our design is based on making it as easy as possible for the customer to purchase,” said Groesbeck of Las Vegas-based Planet 13. Some retailers—including Planet 13 and Denver’s Seed & Smith—have express-checkout options for customers who place online orders. Such consumers can bypass lines and pick up and pay for products more quickly. Customers at Planet 13 also can request a personal budtender to help them with the purchase process, and in-store kiosks give customers another option for purchasing cannabis. Patients at Harmony’s New Jersey dispensary have small consultation rooms where they can talk with patient advisers about their medical conditions. Those rooms ensure patient privacy, according to Brodchandel at New Jersey’s Harmony dispensary. Do create visual product displays. amount of THC and CBD in them, Brodchandel said. Use glass countertops or glass display cases to showcase products, suggested Matt at California’s Caliva. “Many dispensaries have limited space and a vast array of products,” he noted. Visual displays under class countertops or in glass display cases make it easy for customers to see all the products you offer and ask questions about them, Matt and Brodchandel agreed. Do design an Instagram-worthy space. Vibrant art installations or behind-the-scenes peeks at your operations engage consumers and prompt them to share images of your retail space on social media. Las Vegas’ Planet 13, for example, has 15-foot, acrylic and metal lotus flowers and an 18-foot-diameter, globe-shaped fountain—both lighted by LEDs—that have become popular photo opportunities for guests. “The best marketing you can have is word of mouth—and, in this day and age, that means people posting their visit on Instagram,” Groesbeck said. 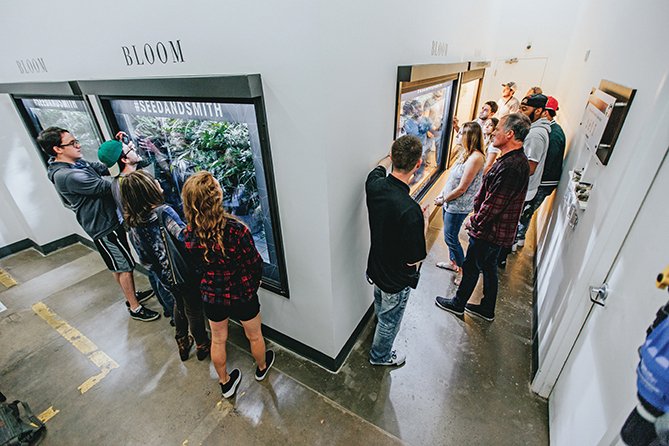 Denver-based Seed & Smith, a vertically integrated cannabis business, leads 40-minute “seed-to-sale” tours through its cultivation and processing facilities. 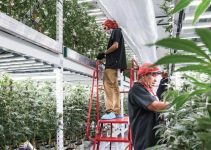 The walk-throughs end in Seed & Smith’s dispensary, because “every good tour ends in the gift shop,” said Brooks Lustig, the company’s chief operating officer. Throughout the tour, customers are encouraged to share photos of Seed & Smith’s marijuana plants and extraction laboratory on social media, Lustig noted, but they’re asked not to post long videos. The tours—and the near-harvest plants Seed & Smith keeps in protected displays in the dispensary—have been a hit with customers who are eager to share images on social media, he said. Don’t overlook practical design elements. 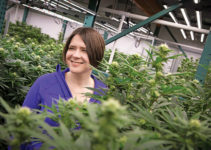 Dispensary owners tend to underestimate the amount of storage space they need, said Seed & Smith’s Lustig. Functional design elements—a full janitor’s closet and added storage for packaging materials and excess inventory, for example—get overlooked, but they’re critical to running efficiently, he said. “As people design new shops, they rarely leave enough room for all the stuff they need to run a dispensary efficiently,” he said. Those storage spaces should be well organized so employees know how to find what they’re looking for, and you need a standard operating procedure for how to move inventory from storage to the front-of-house. That translates to faster, better customer service, Lustig noted. “Eventually, customers will notice if your team can’t run efficiently because you didn’t plan properly,” Lustig said. Don’t forget to have an on-site ATM. It might seem obvious, but it is worth mentioning: If you’re a cash-only retail shop, have an ATM on the premises, said Brodchandel at Harmony. Many consumers—particularly those new to legal cannabis sales—don’t realize that most dispensaries are cash-only businesses, she noted. If consumers leave to grab cash, they might not come back, or they might choose to go elsewhere. Don’t bar windows or have heavily armed guards in plain sight. Security is a challenge for dispensaries, but it doesn’t have to come at the expense of creating a welcoming retail environment. Forgo barred windows and heavily armed security guards. Lustig worked with Seed & Smith’s security alarm providers and local regulators to put safety practices in place that don’t intimidate consumers. Don’t make the space feel transactional. Cramped waiting areas and tight, cluttered point-of-sale counters can make customers feel rushed through their purchases. Similarly, a cold, uninviting retail shop can prompt customers to rush through the store. The use of too much of the color white on walls or in decor, or harsh LED or fluorescent lighting, can tend to make a retail store feel too sterile and unwelcoming, Matt said. Are LEDs Right for You?